In 2000, the U.S. Congress passed the Veterans History Project of the American Folklife Center to collect, preserve and make accessible the personal, unedited accounts of American war veterans so that future generations may hear directly from veterans themselves about their experiences in service to their country. Klingler said he was immediately captivated by the idea of bringing the program to Missouri. Missouri State Senator Jill Schupp (D-24th District) founded the Missouri Veterans History Project in 2011 while she was serving the 88th District as a state representative. Volunteers were sought to interview veterans throughout the state. 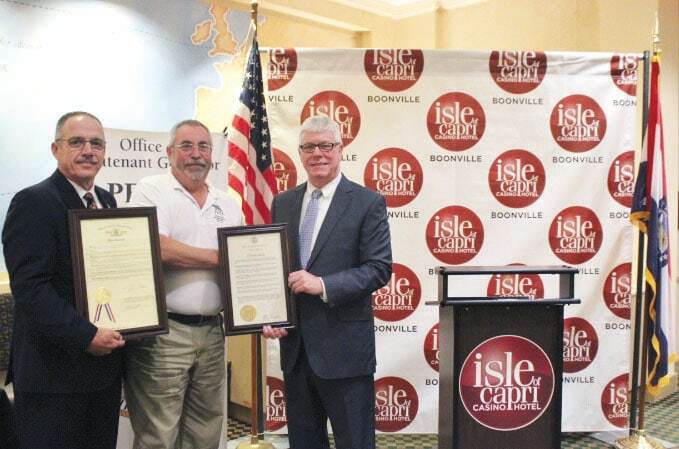 In 2014, Klingler convinced his employers at the Isle of Capri in Boonville to help him establish a chapter to capture the voices of central Missouri veterans and preserve them for future generations. Today, the group of volunteers interviews two to four veterans a month at facilities provided by the hotel and casino located on the southern bank of the Missouri River. To date, the Missouri Veterans History Project has recorded the stories of more than 500 veterans. One copy of the interview goes to the veteran to share with his family. The interviews are also on file with the U.S. Library of Congress and by the State Historical Society of Missouri. Klingler says the interviewers might ask questions to steer the course of an interview, but the stories come directly from the veterans. “We don’t want to hear anything that the veteran doesn’t want to tell us,” he says. Southeast Missouri veteran who Klingler has interviewed had served in the WWII Battle of Okinawa, most recently depicted in the movie, “Hacksaw Ridge.” “Needless to say, it was a very interesting interview,” Klingler says. In 2016, Klingler was one of 34 Missouri veterans to receive the Veterans Service Award from former Lt. Gov. Peter Kinder. The award is given to veterans who provide exemplary volunteer service to their communities. “Working with Isle of Capri Casino, he has devoted his passion and dedication to the effort to capture the oral histories of our Missouri veterans,” Kinder says. To learn more about volunteering or being interviewed by the Missouri Veterans History Project, go to MVHP.net or call 573-522-4220 .